Eye On Sports Media: Don't Like That Color Analyst? Go Tell The League Commisioner! Don't Like That Color Analyst? Go Tell The League Commisioner! Athens, GA (May 4, 2008) - We all have play-by-play announcers or color analysts that, in our eyes, are the best thing since sliced bread or worst than the liver our mom's forced us to eat as kids. Many fans are so upset at what they hear on the airwaves that they will either call the broadcasting network, or will even go so far as to place a call or send a letter to the league commissioner. But what would you do if the color analyst happens to BE the league commissioner? League Commissioner Cheri Kempf, in Athens, GA today for the FSN broadcast of women's softball game between top-ranked University of Alabama and the University of Georgia, told Eye on Sports Media that she will work alongside up and coming play-by-play announcer Bernie Guenther for the weekly Fox broadcasts of NFP games. 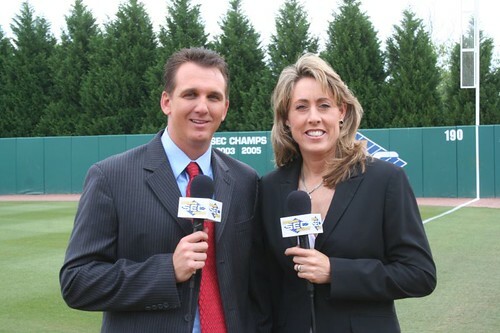 National Pro Fastpitch League Commissioner Cheri Kempf (right) will team up with up and coming play-by-play announcer Bernie Guenther for 12 weekly broadcasts of 2008 league games. There are six teams in the league,and the regular season schedule will begin on May 29, 2008. Each team will play 48 regular season games. In addition to league play, NPF member teams will once again take on international competition. Chinese Taipei, Venezuela, Canada and the Netherlands will all play at least two series against NPF teams. The season will last a total of 12 weeks and will conclude the weekend of August 17. Upon completion of the regular season, the top four teams will earn the right to play in the NPF Championship Series, double-elimination format tournament held in Kimberly, Wis. All games will be played at Kimberly's Sunset Point Park lower diamond and will again be hosted by Cardinal Youth Softball. Two games will be played on Friday, August 22, Saturday, August 23 and Sunday, August 24. A third game could possibly be played on Sunday if the team advancing through the loser’s bracket wins the first championship game.